When you’re travelling in the tropics it’s not always easy to know what to pack, particularly if you’re from a cooler climate. Whether you’re visiting from down south or from further abroad, it doesn’t hurt to consider what is really essential and what is totally unnecessary when it comes to a visit to Port Douglas. The locals can easily spot tourists who didn’t get the memo on what to pack and it usually starts with a couple of minor wardrobe fails and some stinging pink skin to make you stand out. Don’t stress though, even if you arrive for your Port Douglas holidays a little ill-prepared a quick trip to the shopping mecca of Macrossan Street will see you kicking pack in tropi-cool style. If you’re looking for a little help on what to wear, what not to wear, what to pack and what to leave at home, read on for some helpful hints. First and foremost, a visit to Port Douglas is all about relaxation, so don’t worry about getting too glammed up. Pack lightweight clothes that are casual and comfortable. Even if you happen to be visiting to attend a wedding or event, you can leave formal attire like jackets and ties at home because they won’t be necessary. In saying that, with a calendar jam packed full of exciting events, the people of Port Douglas do love a chance to get dressed up. With everything from waterfront parties, celebrity chef dinners, long lunches and soirees under the stars, there are plenty of events worth stepping out in style for. Still, even fancy clothes are light and flowing around these parts. Think stylish kaftans and elegant maxi dresses. Again, a visit to the boutiques on Macrossan Street will set you on the right path. Surely it goes without saying that you need to bring your swimmers and flip flops? That’s kind of the unofficial uniform around Port Douglas. When you’re not at the beach, a simple sarong or beach cover up will be fine to slip on over the top and hit the waterfront restaurants for a long a leisurely lunch. You may want to consider bringing your ‘good thongs’ or sandals if you plan on stepping out for a drink and some entertainment at night time. Thongs and sandals are typically fine for day trips to the rainforest, however you might want to consider packing your sneakers if you plan on exploring further or taking part in some adventure activities. They’ll also come in handy if you feel like going for a jog along Four Mile Beach or hiking the National Parks, if you’re so inclined. Another good option to pack ‘just in case’ is a light jacket, wrap or cardigan. If you happen to be visiting during the winter months, it doesn’t exactly get cold, but if you plan on enjoying alfresco dining of an evening you may find it more comfortable. 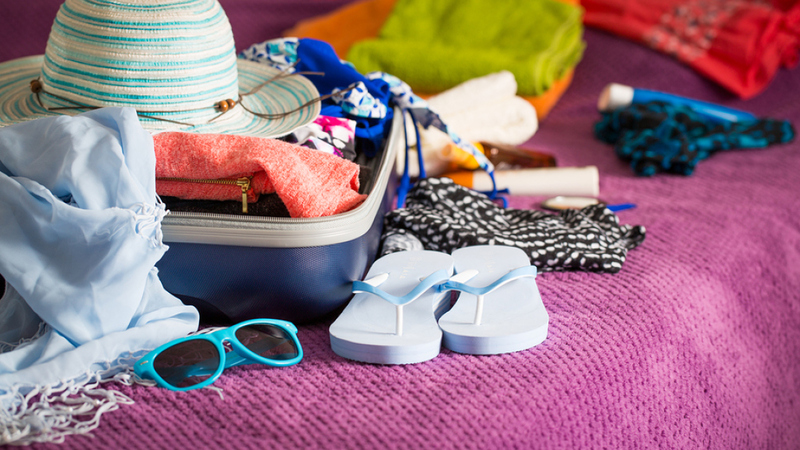 Above all, the most important thing you can pack is sun protection! Forget about trying to look ‘cute’ you need something that is going to cover your face properly. Sorry to sound like your mum, but trust us, you won’t look cute when you’re red as a lobster and peeling! Unless you want to end up blind and wrinkled, sunglasses are also a must, however these can be as cool and as cute as you like. Try to minimise your sun exposure, drink plenty of water and above all else, slip slop slap! You don’t want to ruin all over your amazing holiday pics by looking like a beetroot! While we’re on the subject of looking cute, you might as well leave your hair straightener at home. The tropical climate is much more suited to the boho beach waves and messy bun looks. It’s fine, embrace this concept early and just relax and enjoy it! You’ve been warned, attempt straight sleek locks at your own risk.